Anthony Musto (left) and Mario Musto Jr., brothers who are second-generation owners of Hyde Park Masonry & Landscape Supplies, watched as flames tore through the warehouse. A five-alarm fire broke out Saturday night at a landscaping warehouse in Hyde Park that had hazardous chemicals on site, and crews were expected to be on the scene throughout the night, fire officials said. The fire was reported around 5:40 p.m. at Hyde Park Masonry & Landscape Supplies, at the corner of Hyde Park Avenue and Grantley Street. Chemicals used in landscaping, including fertilizer, were contained inside the single-story building, Fire Commissioner Joe Finn said. “We know that there’s hazardous material inside the building so we’re doing our best to keep people away,” Finn said, speaking at the scene. The fire sent thick black smoke into the air. Residents of apartment buildings and houses on Grantley Street were evacuated but were expected to be able to return home late Saturday. A collapse zone was established around the one-story building in case the structure collapsed, Finn said. Firefighters were ordered outside the building as a precautionary measure, Finn said. “We have not been inside, and we don’t plan on going inside, he said. No one was inside the building when the fire began. Two firefighters were sent to the hospital, one for exhaustion and one for a back injury, he said. A spokeswoman for the state fire marshal’s office could not be reached for comment. 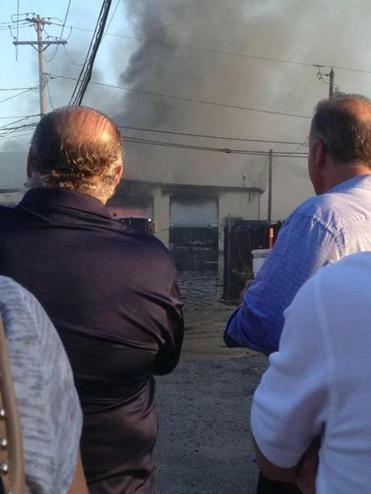 Anthony Musto and Mario Musto Jr., brothers who are second-generation owners of the business, watched from an alley as flames tore through the warehouse. He did not discuss what type of chemicals were stored in the warehouse. Anthony Musto declined to comment. The business, founded in 1982, is a staple of the Hyde Park business community. “They’ve been around forever,” said Kathy Bingham, a manager of Cavan Cafe, which is located in the same block. Bingham said she spotted the smoke Saturday, and called Anthony Musto, whom she said is a friend. Felicia Gans can be reached at Felicia.Gans@globe.com. Follow her on Twitter @FeliciaGans. Adam Sennott can be reached at adam.sennott@globe.com.